A Central Texas floodplain has yielded what its discoverers are calling the oldest credible evidence of human settlement in North America — going back as far as 15,500 years, 2,500 years before the Clovis technology once accepted as the benchmark for the first Americans. 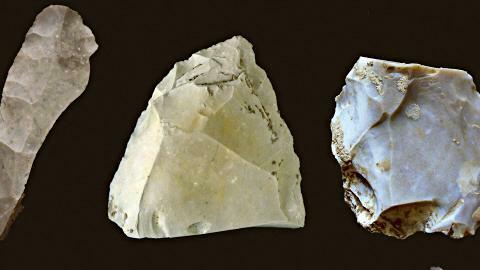 Near Buttermilk Creek, about 15 miles northwest of Georgetown, researchers from Texas A&M and Baylor universities found nearly 16,000 stone flakes, projectile points and tools in a soil layer that they dated to the end of the last Ice Age. Their article on the five-year excavation appears Friday in the journal Science. “This makes the … site the oldest credible archaeological site in Texas and North America,” said Dr. Michael Waters, the lead researcher and director of Texas A&M’s Center for the Study of the First Americans. That assertion and other conclusions reached by the Texas researchers may be open to challenge, however. Other North American sites with pre-Clovis artifacts have been dated as much older. They include sites in Nebraska and Pennsylvania that scientists have dated back as far as 22,000 years. Waters told reporters that the large number of artifacts his team found, the style of tool-making and other factors gave what he branded the Buttermilk Creek Complex the strongest claim as North America’s oldest archaeological site. “The evidence from these [other] sites, while evidence, is not robust, and there is not a lot of artifacts there,” he said. For much of the past 80 years, archaeologists believed that the first Americans arrived from northeastern Asia about 13,000 years ago via a now-submerged land bridge to Alaska and brought with them a tool-making technology dubbed Clovis for the New Mexico site where it was first found. Clovis artifacts have been characterized by a distinctive groove, or fluting, along the length of a projectile point — popularly called an arrowhead — and other techniques. Recent research findings, including the discovery of North American artifacts that clearly predate Clovis technology at numerous sites, have all but ended the Clovis-first theory of New World settlement. Northeastern Asia is still acknowledged as the source of the earliest Americans, but recent findings have established that they first arrived well before 13,000 years ago, the approximate time of Clovis technology. Still open to debate, however, are questions such as just when the migration began; whether they came in a mass movement, in successive waves or in small, unrelated groups; and how their tool-making technology evolved. Some scientists also maintain that people reached the Americas by boat rather than, or in addition to, crossing the land bridge. Scientists have called the lack of clear understanding of human settlement of the Americas — the last mass cultural migration of prehistoric times — one of archaeology’s biggest voids. Waters said the technology evident in the Buttermilk Creek Complex artifacts, as well as their placement in the soil below later Clovis and Folsom items, provided important clues about how and when human culture developed in North America. They suggest mobile hunter-gatherers who took advantage of a cool, comfortable climate, followed game and plants in a cycle of seasons and frequently revisited a place in the Texas Hill Country that provided water and chert, a stone used for tools and points, researchers said. Waters said the artifacts share some traits with Clovis items, but lack the classic Clovis fluting. He said they may display techniques that later developed into Clovis culture as people refined their tool-making styles and skills. However, some aspects of the Buttermilk Creek findings are already being questioned. Key among them is whether the Texas researchers had enough unambiguous data to claim that their artifacts are distinct from Clovis technology rather than just an early version of it. “I find that Block A [of the excavation], where the deeper materials are located, is a small excavation unit, yielding just enough data to ponder its meaning rather than provide hard evidence to support the conclusions of this paper,” Dr. Tom D. Dillehay, an anthropology professor at Vanderbilt University, wrote in an email to The Dallas Morning News. “My response is to return to the site and excavate more of it,” wrote Dillehay, who assessed the current state of scientific knowledge about the first Americans for the Proceedings of the National Academy of Sciences in 2009. He was not involved in the Texas project. Other potential issues include the characteristics of the soil containing the pre-Clovis artifacts, the method of dating the layer containing them and the nature of the items themselves. Researchers could not use carbon-14 dating to determine the site’s age because it did not contain enough organic material for testing. Instead, they used a method that allows dating by measuring the geological evidence of past exposure to sunlight. They also carefully analyzed the soil structure to make sure the artifacts had not shifted from one layer to another over time, said Dr. Lee Nordt, a Baylor University geologist and dean of Baylor’s College of Arts and Sciences. Nordt is a member of the Buttermilk Creek research team. No evidence arose to suggest that the artifacts had moved from their original layer in the soil, Nordt said. Waters said the team members rigorously questioned themselves on the potential disputes before issuing any conclusions. Des débris retrouvés au Texas appartenant possiblement à une société pré-Clovis. La découverte d'outils de pierres anciens sur un site de fouilles archéologiques au Texas pourrait faire avancer de 2500 ans la date officielle de l'arrivée des premiers hommes en Amérique du Nord. Les milliers d'artefacts retrouvés datent d'entre 13 200 et 15 500 ans. Ils ont été découverts dans le sol, cinq pieds sous l'endroit où des archéologues avaient déjà retrouvé des outils de la culture Clovis, considérée jusqu'à maintenant comme étant la première population en Amérique, établie il y a 13 000 ans. Selon la thèse acceptée jusqu'ici, les Clovis auraient voyagé de l'Asie à l'Amérique en empruntant le détroit de Béring. À l'époque de leur voyage, le niveau d'eau des océans était plus bas, à cause des glaciers plus nombreux qui retenaient l'eau. Un couloir de terre aurait alors été dégagé, et aurait permis aux Clovis d'atteindre le Nouveau Monde à pied. Or, l'hypothèse de plus en plus reconnue voulant que des hommes soient arrivés sur le continent américain avant l'avènement de la culture Clovis vient bouleverser cette théorie. Les archéologues croient maintenant que les premiers hommes arrivés en Amérique - à une période où les glaciers bloquaient l'accès au continent - auraient en fait longé les terres le long du littoral dans de petites embarcations. Jusqu'ici, 15 528 artefacts ont été découverts par l'équipe du chercheur Michael R. Waters de l'Université A&M, au Texas. Il s'agit, par exemple, de débris de lames, de grattoirs et de hachoirs. Le style de fabrication de ces outils laisse croire qu'ils pourraient en fait avoir mené au développement des outils à la signature cannelé de la culture Clovis. D'autres sites archéologiques en Amérique recèlent possiblement eux aussi des artefacts d'une ère « pré-Clovis ». Selon M. Waters, toutefois, aucun n'en contiendrait autant, ni ne serait aussi crédible.